"Listen son, I know just how you feel." "In that case you won't hold me up with a lot of talk, will you?" Kid: In the first place, the white people steal the land from the Indians, right? Judge: They get paid for it, don't they? Kid: Paid for it, yeah. A measly dollar and forty cents an acre  price agreed to at the point of a gun. Then the immigrants sweat and strain and break their hearts carving out a civilization. Fine. Great. Then when they get it all pretty and prosperous, along come the grafters and land grabbers and politicians, and with one hand skim off the cream and with the other scoop up the gravy. (Shakes his head.) Not for me. 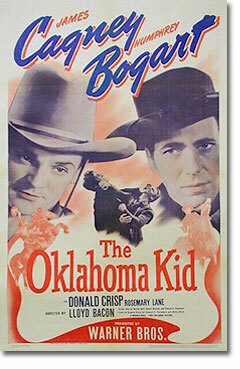 The plot pits the good, dull people of Oklahoma, represented by John Kincaid (Hugh Sothern), against bad guy Whip McCord (Humphrey Bogart). During the land-rush, McCord and his men are "Sooners"  they leave early and grab the land Kincaid wants to build a city on  forcing Kincaid to make a deal. The city will be built (it becomes Tulsa), but McCord gets exclusive rights to all saloons and gambling houses. It's a deal fraught with inevitable tensions. Eventually, when the two start jostling elbows, McCord frames Kincaid for murder and railroads him with bribed judges and juries. It's up to the outlaw, The Oklahoma Kid, to save the day. At first his interest in the Kincaid case seems inexplicable. Then he admits that John Kincaid is his father  a revelation that helps the story make sense if not the casting. Kincaid and his son, Ned, are played by tall, lean actors, while the Kid is neither. In fact, in his big ten-gallon hat, Cagney at times seems like something out of The Terror of Tiny Town. Who cares, right? Nobody lights up a screen like Cagney. He's fun to watch because he seems to have so much fun himself. Everything is a source of joy and amusement to him. As the Judge's daughter hides him from the law, Cagney smiles and refers to the reward for his capture. "Here's a chance to get yourself five hundred dollars," he says. Earlier there's a charming scene where Cagney begins to serenade a crying Mexican baby, catches himself, then begins again in Spanish, while the baby plays with his kerchief.